My husband and I have been empty nesters now for one week. Unlike other empty nesters we’ve talked to over the past week, we have not been jumping for joy, nor have we been immediately renovating bedrooms to make spaces that are suited to our new lifestyle (and to discourage children from moving home)…no, we’ve been quietly contemplative about this new “season” in our life. We haven’t quite embraced it yet, but we haven’t been depressed either. Still, it is decidedly pleasant to have the house to ourselves, my husband and I, and to enjoy the peace and quiet that comes with having an empty nest (house). * We are no longer confined to a set schedule each day. (We can eat when we want to, and we can eat what we want to.) My menu was always catering to children’s likes and dislikes, now we can eat foods we like that they would have turned their noses up at. * We can watch T.V. shows that we like rather than watch their shows all the time. * We can have uninterrupted conversations and lately we’ve even had conversations that were NOT about the children! * We can keep a neater house without clothes, and shoes littering the entranceway and unwashed dishes piled up in the sink. * We reminisce about all the ways our children bring us joy rather than focus on rebelliousness and past activities that may have brought us grief. Selective memories I guess, and they’re all good! * When the children call or text or show up unexpectedly, it’s like a special event. I enjoy every precious moment with them and look forward to the next time I hear from them. We made the schedules not the kids. The T.V. shows we watched together were not as important as spending precious time with them. Interrupted conversations meant there were always teachable moments. A cluttered house meant a house that was well-lived in. We spent an inordinate amount of time fretting over rebelliousness rather than focussing on pure joy. And lastly, our children were then, and always will be our gifts from God to enjoy and cherish for a lifetime! This entry was posted in Family Life, Proverbs 16:9 - Journey Thoughts and tagged Children, empty nest, empty nest syndrome, empty nesters, Family, kids, parents, peace and quiet, rebelliousness. Bookmark the permalink. As a fellow new empty-nester, I appreciate your thoughts and your attitude. I’m not particularly resigned to this new state yet, but I’m trying. Starting a new blog was one of my attempts at coping with all the time I now have to myself. Hello. I am sharing the same moment in time as you. I have just become a mother with children who don’t live primarily at home anymore. 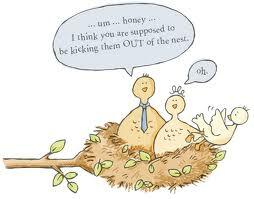 I love your positive view of the “empty nest”. But as you say there were many gifts to having years of sharing a home with great children too. It’s all good. Check out my blog. I’m not going to write for a while again but I enjoyed writing for a month or so. Great post! You nailed it! lovely post…I remember when I went to the grocery store after they moved out. I almost cried in the snack aisle, because I knew I didn’t have to fill up the snack drawer. But, the house does stay cleaner.